When it comes to holiday postcard illustrations, the artist Ellen Clapsaddle is in a league of her own. Her work is bright, colorful and full of charm. 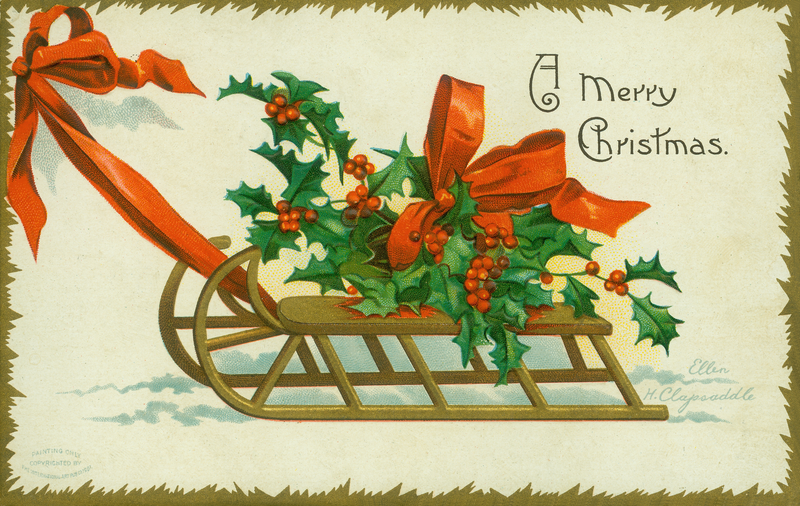 This Merry Christmas sled postcard is no exception. Perhaps one of the most well-known of all of the artists from the “Golden Age of Postcards”, Ellen Clapsaddle (1865-1934) may also be one of the most prolific. She created over 3,000 designs for souvenir, greeting postal cards. Her pieces have become highly prized and collectible. Surrounded by a ice-like gold border, this holiday postcard features a simple sled being pulled through the snow. A large bouquet of holly leaves and berries rides upon the seat of the sled. A red bow further decorated the red berries and green leaves. Rather than having a simple rope to pull the sled, Clapsaddle added a second red bow and ribbon. The card bears her signature and a short holiday greeting, “A Merry Christmas”. 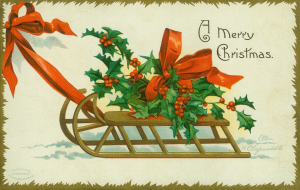 The International Art Publishing Co. Ltd. of New York published this Merry Christmas sled with holly postcard in 1907. The card itself was most likely printed in Germany. You can click on the picture shown above to retrieve the full-sized image.